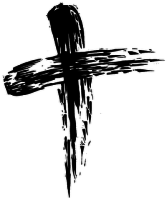 Lent starts on Ash Wednesday and ends on Holy Thursday. The 40 days of Lent, which lead up to Easter, remind us of the 40 years the Israelites wandered in the wilderness and also of our Lord's 40 days in the desert where He was tempted by the Devil (Satan). In Lent we participate in abstinence, times of fasting, confession and acts of mercy to try and strengthen our faith. Ashes are a sign for us of repentance and remind us of our own mortality. By receiving ashes on our foreheads we are acknowledging, through this sign, our need for conversion in our lives. The ashes for Ash Wednesday are made from blessed palm branches from the previous Palm Sunday. The ashes are sprinkled with Holy Water before distribution. The 3 pillars of Lent that we try to observe are ... Prayer, Fasting and Almsgiving.